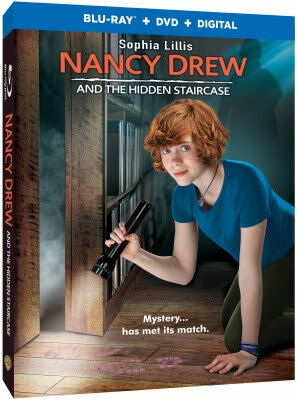 From the classic Nancy Drew books, the iconic mystery solving teenager is back in all-new feature length film "Nancy Drew And The Hidden Staircase" now available on digital (SRP:$19.99) and on Blu-ray Combo Pack (SRP:$28.98) & DVD (SRP:$19.98) on April 2, 2019 from Warner Bros. Home Entertainment. A Sleuth, A Girl and an Inspiration” – the cast talks about growing up with Nancy Drew. Nancy gets that opportunity when she is asked to help solve the ghostly activity at the Twin Elms mansion. Can she help explain the creaking footsteps, exploding lightbulbs and the ominous creature? Is it the handiwork of high-school bully Derek Barnes? Or is it possible that the ghost of original owner Malcolm Colfax is back for revenge?